This week we have spent mostly in the sewing room, making new bags for our bagshop. 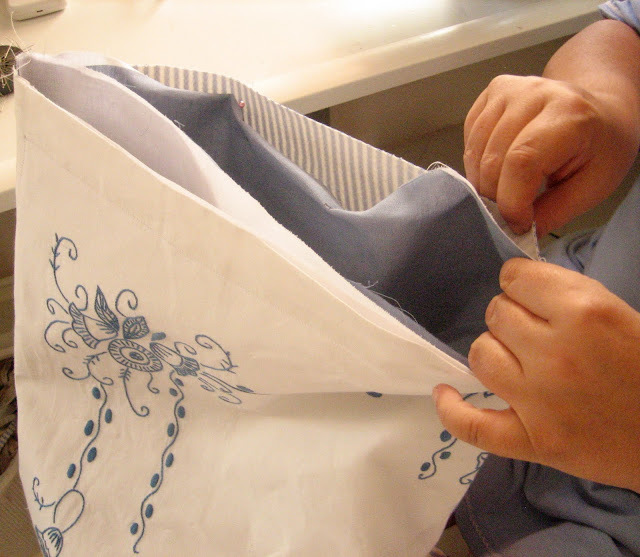 As we have alot of fabric it always takes alot of time to gather all the materials we want for a bag. We prepair the materials of a bunch of bags so that we can sew for a few days without having to search for something every few minutes. All the bags we have made lately have vintage embroideries, so much fun to use those old things and give them a second life! Your workspace is a treasure trove!! Love the embroidered fabrics! What a wonderful space, and your bags are superb! fabulous! lovely to see all the different fabrics .. and your new bags are just gorgeous. A lot of work for you both! I can't wait to see that gorgeous white and blue embroided bag! Your bags are truly unique and beautiful! It was fun to get a glimpse into the studio. You are both such creative gals! mmmm, your fabrics look very yummy... I am so courious of your new bags! Look at all those lovely fabrics! The bags must be beautiful! 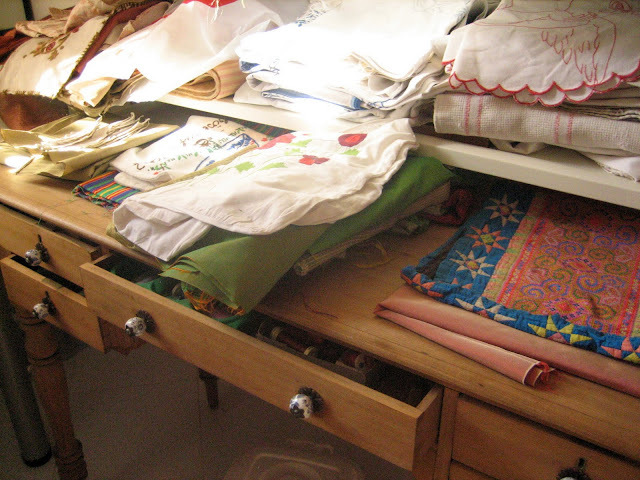 I cam upon your blog today in my dashboard since I'm a follower of your blog and I must say your space for your embroidered fabrics is an awesome space! An artist's eye candy. I need to check out your bags now! From what I see they are gorgeous! I just checked out your awesome Etsy shop and realized I had been there already and hearted it! What a gorgeous fabric! Beautiful worspace! Your pictures are really inspiring... Gr8 is right, it kinda looks like Ali Baba's cavern in your space ! Wonderful fabrics and wonderful work space! Estella your workspace is very inspiring today! Looking forward to see the productions after these few days of sewing!! Always such a beautiful aesthetic in your space, love that table, gorgeous handles. My, you have a huge collection of fabrics and they are all lovely going with your new bags. I love a visit to your space...just so beautiful. Such a great work space and you are so creative!